A Twittervention! What If There Was No Twitter? I love Twitter. And, obviously, lots of other people love Twitter, too. There was a coincidental Twitter love fest yesterday when both Scott Stratten and DJ Waldow wrote posts about how Twitter has enriched their lives and how it’s caused all this great “stuff” to happen to them. I get it. I feel lucky to have Twitter, too. Twitter has been a great tool for extending my professional reach and it’s introduced me to some of my favorite friends in Troy. But one day Twitter is going to die. And then what are we going to do? I don’t mean to be an alarmist, but we can’t deny the inevitable. What goes up must comes down. It’s like the circle of life and all that jazz. As golden as Twitter is today, one day that will fade and we’ll have to move on to something else. But if Twitter died today, would you be prepared? Could you focus on some of the other stuff you’ve got cooking or is Twitter all you’ve got in your basket? I guess the question is: How else are you building and promoting your brand? 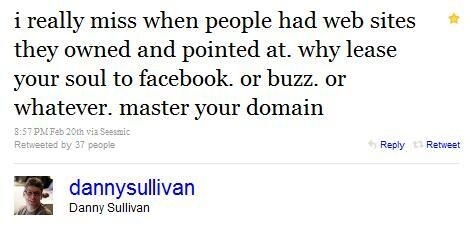 This weekend, Danny Sullivan put out a tweet that I think struck a chord with a lot of people. Me too! I talk to small business owners every day who have a Facebook and Twitter account but that don’t have a Web site. I read tweets from people about how they’ve stopped blogging because now they have Twitter and it’s ‘so much easier’ to talk to people. Hell, I’m guilty of the same. I’d probably have my own personal blog (or book) off the ground if I really wrote about the things happening to me instead of just throwing them up on Twitter. As great as Twitter is, I think it’s important to remember two things. But I don’t believe him. I think he would have these things without Twitter. Because Scott would have been working to create his relationships through other channels – whether that be his blog, another Web site, a new community, etc. Scott hasn’t accomplished what he has because of Twitter, he accomplished it through Twitter. Twitter is the medium. The medium can always be replaced, which is why we shouldn’t tie ourselves to just one. I think that’s an important lesson (and one maybe newspapers could learn). The same people who think social media will save their lives or that creating a blog will find them that audience they always wanted – it’s not the medium that’s important. It’s what you’re using the medium to put out. It’s like saying that Heather Armstrong found an audience because she had a blog. Or that the snowboard made Shaun White successful. Being an excellent writer made Heather Armstrong stand out. Being a great athlete made Shaun stand out. The blog and the snowboard were just the mediums they used to accomplish great things. As I’ve mentioned, I love Twitter. I think Twitter is an amazing tool for small businesses owners. But it’s only one tool. And any time you put all your eggs in one basket you’re setting yourself up for a serious crash. Be on Twitter, but don’t stop there. Extend your reach and brand as far as it can go. It means you don’t stop blogging because you’re on Twitter. It means you don’t let your Web site fall apart because you have a Facebook fan page. It means you don’t drag your feet creating an email newsletter because you have a LinkedIn Group. It means you don’t do ALL of your networking on Twitter just because ‘it’s there’ and ‘it’s easy’. It means you don’t stop building your own platforms just because you’re leasing someone else’s. Building your business means creating as many satellite communities as you can and putting effort into creating stuff that you can own. You own your Web site. You own that newsletter. You own your blog posts. You own the community that you build on your Web site. You don’t own Twitter. You have no say in what happens to it or the direction that it goes in. You’ll get no argument from me that Twitter rocks, but you need to ask yourself if you’re creating enough of “your” stuff on top of that. If Twitter disappeared tomorrow, would you still be able to leverage the audience ? Are you finding ways to take people off Twitter and direct them to the material that you do own? Because if the answer is no, then you’re not using Twitter. You’re just playing with it and setting yourself up to start from scratch once Twitter friendsters itself out. Home › Internet Marketing Blog › Social Media › A Twittervention! What If There Was No Twitter?